The two skiers have commanded the wins this season for the overall sprint cup. Stina Nilsson of Sweden and Norway’s Maiken Caspersen Falla remain the speed skiing torch bearers. Only Nilsson and Falla have won multiple sprints in 2018/2019. 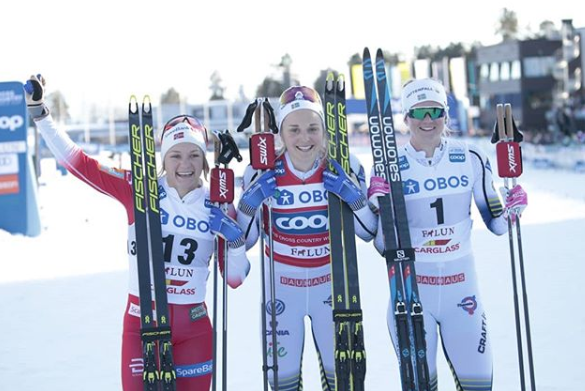 Falla won the World Championship sprint in Seefeld and the last three of four individual sprints coming into Falun’s sprint on Saturday. 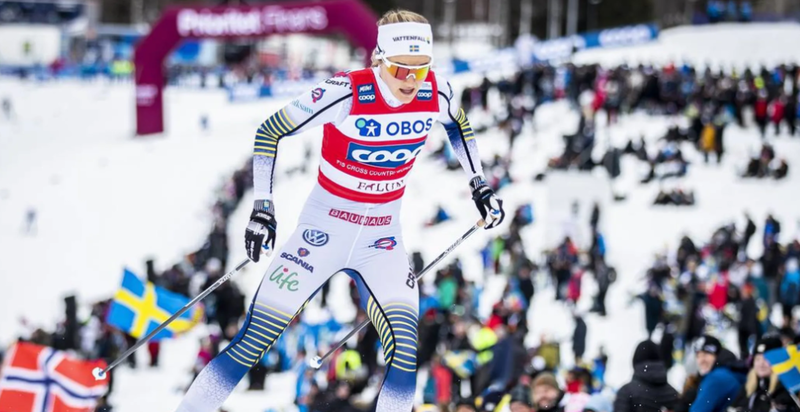 Earlier in the season Nilsson went on her own run — winning four individual sprints in succession. 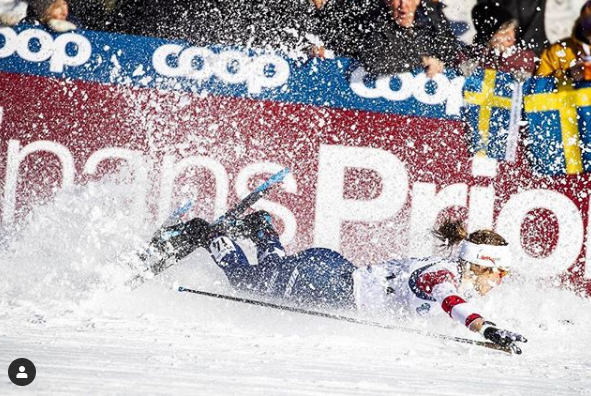 Yet in the past two World Cup sprints, Nilsson tripped up her winning pattern and did not podium as she recovered from a hip injury suffered in mid-January during a semi-final in Otepää, Estonia. Have no fear Swedish fans. The athlete that closed out the women’s 4 x 5 k relay for the World Championship win recently, arrived to treat the home country fans to a win. The only imperfection on what became a perfect day was her third place in qualification. Nilsson’s teammate, Maja Dahlqvist, took the top-spot honors as she qualified with the fastest time of 2:55.0. Nilsson’s time was 2.81 seconds behind. Otherwise, Nilsson won her heat, the first semi, 0.52 ahead of Caspersen, and the final, 0.67 ahead of the Norwegian. A little less than a minute later, after she had remained in Falla’s shadow, skiing just off her tails, Nilsson came around on the final climb with a hefty V2 and formed enough of a gap to be a meter or two ahead into the final straight. With her fifth sprint win of the season, Nilsson maintains a narrow lead for the sprint cup. She leads with 576 points over Falla, who trails in second overall with 543 points. A single sprint race remains — a skate sprint on March 22 in Quebec, Canada. The tenuous conditions, with deep sugar snow here and there out on course, took a toll on the qualifying U.S. skiers. That qualifier surprise was a fourth place qualifying time. And she advanced to the semis after placing second to Dahlqvist in her heat. “My quarterfinals worked out perfect, and I felt great about my tactics and skills on the course,” Bjornsen added. Yet the skier’s good fortunes waned in the semis. Her fall aside, Bjornsen’s stop/go rebound earned her a 10th place overall as she preps for tomorrow’s 10 k skate. Sophie Caldwell’s (USST) path to her 11th overall was marred less by a stop/go and more of a slide on harsh granulated snow. Before the tumble, she qualified in 14th, 8.41 seconds off the leading time. Despite her sensations, Caldwell won the first heat and lined up in the first semi with Nilsson and Falla. Caldwell, skiing in the rear of the train of skiers, took a rough slide when she lost her footing while schussing through a corner. The American cross-country staple, Jessie Diggins (USST) also became a deep sugar snow stat. Instead of being taken out in the semis like Caldwell and Bjornsen, Diggins fall came about halfway through the course on the banked downhill corner. In front. In control. Diggins set the tempo in her heat. Diggins rounded out the U.S. results in the top-30 with a 28th place overall. As has been documented, it’s been a whirlwind year for Diggins. After Sunday’s race in Falun, it will be time for Diggins to head back across the Atlantic and into the throng of Quebec’s ski fans. “I’m very fortunate to have so many family members coming to Quebec to cheer and I’m so happy and excited to see them, and sometimes knowing you’ve only got one weekend of World Cups left leaves you with better energy than, say, a month out from the end,” explained Diggins. Sunday’s racing features a 10 skate for the women and a 15 skate for the men.